Satellite 6.2 introduced an exciting new feature called remote execution, which allows administrators to remotely run an arbitrary command on Satellite clients quickly and easily. 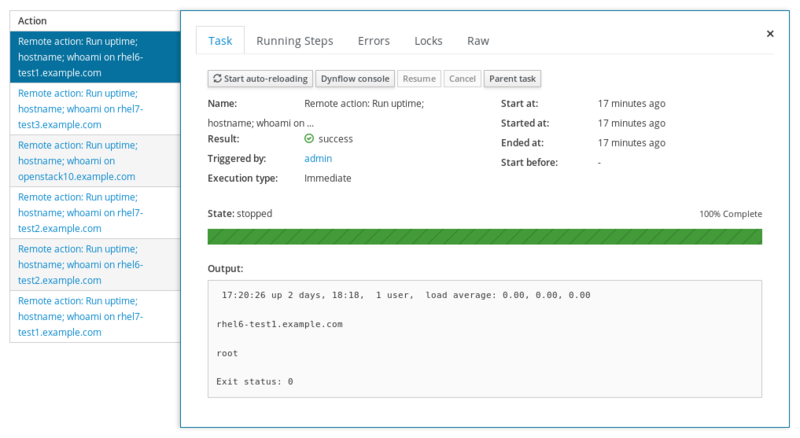 This post will cover an overview of how you can utilize remote execution. The Satellite documentation (for Satellite 6.2, and Satellite 6.3) walks through the process to set up remote execution, so that’s not covered in this post. We’ll pick up after remote execution has been enabled. Once remote execution has been set up per the Satellite documentation, we are ready to run our first remote execution command. 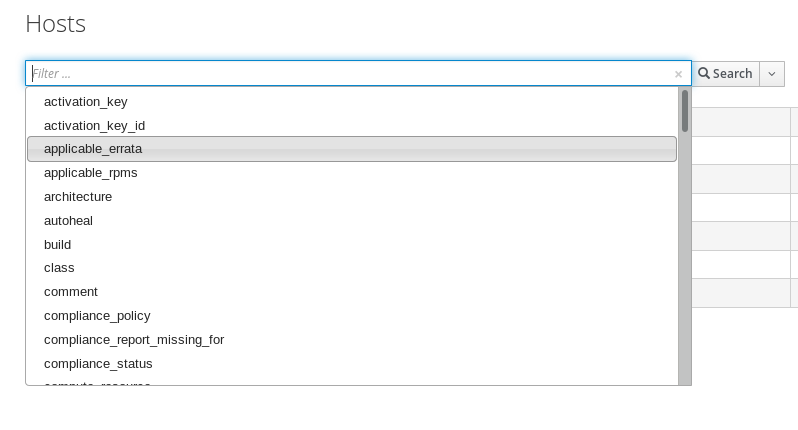 Start by logging in to the Satellite web interface, then going to the "Hosts" drop down, and selecting "All hosts". Next, select the hosts to run the remote command on, then click on the "Select Action" drop down, and select "Schedule Remote Job." On the next screen, make sure the "Job category" is set to "Commands", and "Job template" is set to "Run Command - SSH Default". In this case, the command was successfully run on all six hosts, and returned a zero return code. If the commands return a non-zero return code, it will display as failed (try running "/bin/false" as a command to see what a failure looks like). It is also possible to run remote execution commands from a shell on the Satellite server, using the hammer command. # hammer job-invocation create —job-template "Run Command - SSH Default"   —search-query "query" —inputs command="command"
The search query option is powerful and flexible, and I recommend referring to the Satellite documentation for more information on how to use this functionality. It is possible to interactively build search queries in the Satellite web interface by going to "Hosts", "All Hosts", and clicking on the "Filter" box, which will then bring up a list of fields that can be filtered on. It is also helpful to test search queries on the web interface to validate which servers are returned by a given search query. In addition, it is possible to save search queries through the Bookmark functionality so complex queries don’t need to be typed in every time they are used (the bookmark menu can be accessed by pressing the down arrow next to the Search button in the screenshot above). # hammer job-invocation create —job-template "Run Command - SSH Default"   —search-query "hostgroup = RHEL7" —inputs command="df -m"
In the first Satellite web interface example, we simply manually selected which hosts we wanted to run the command on from the "Hosts", "All Hosts" menu. It is also possible to use the powerful search query functionality to select which hosts to run the commands on from the Satellite Web Interface. To do this, from the Satellite Web Interface, go to "Hosts", and select "Job templates". Then click the "Run" button to the right of "Run Command - SSH Default"
From here, we can either use a previously saved search query bookmark, or we can specify a search query. With the Satellite web interface, it is necessary to click on each host to see the host’s output. Similarly, from the hammer command line, we need to run a command for each host to see each host’s output. 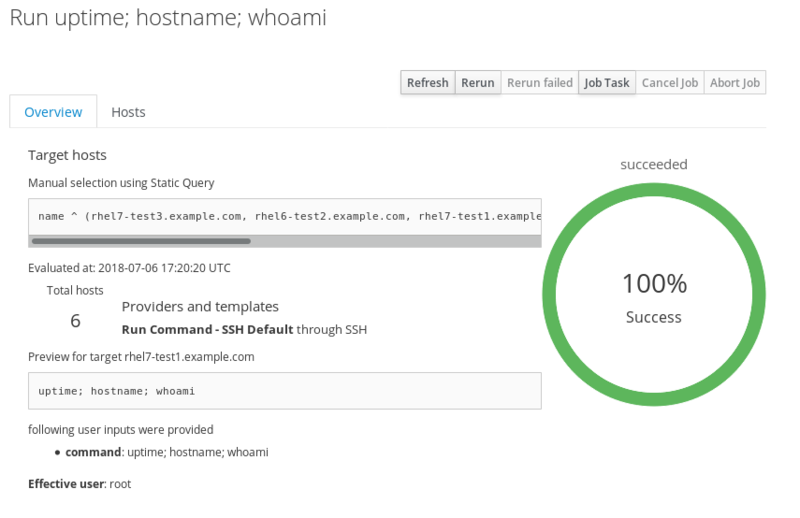 # hammer job-invocation create —job-template "Run Command - SSH Default"   —search-query "hostgroup = RHEL7" —inputs command="getenforce"
Based on this output, we can easily see that SELinux is enforcing on all hosts within the RHEL7 hostgroup. 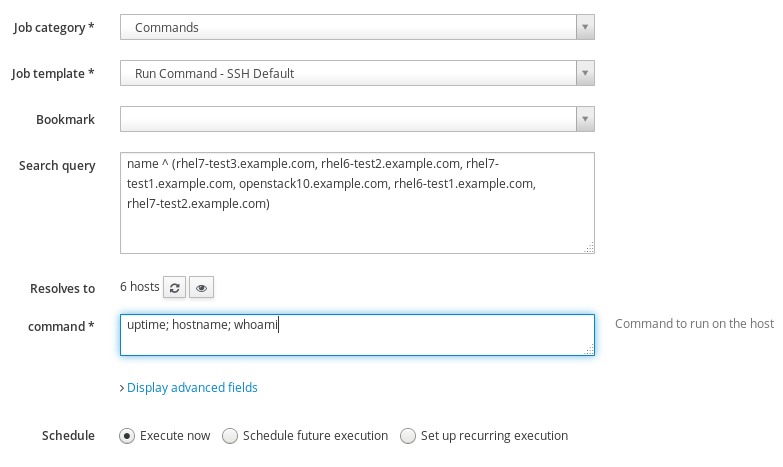 All of the examples so far have been commands we specified using the "Run Command - SSH Default" job template, which allows any arbitrary command to be run on a remote host. However, there are a number of job templates included with Satellite, and it is possible to create additional job templates. A job template is a powerful tool to make running remote commands consistent and easy to use, and makes it possible to add additional logic for handling things such as different versions of RHEL. 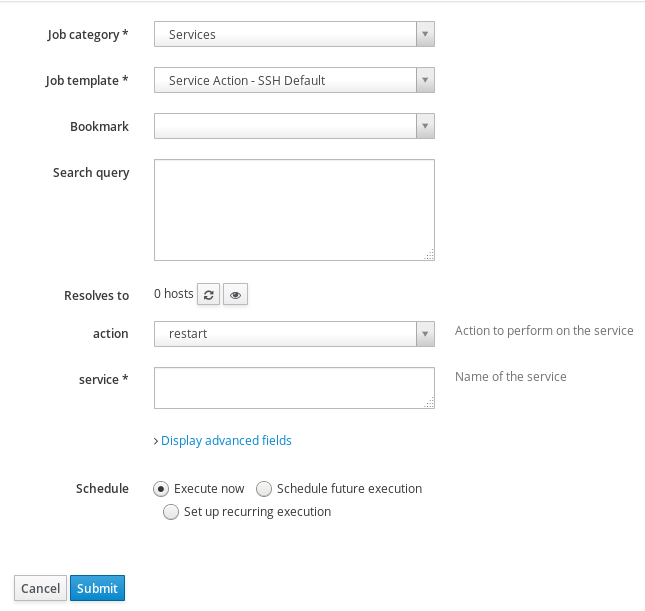 To demonstrate what a job template is and how to use one, we will look at the "Service Action - SSH Default" job template included with Satellite. To view this job template, from the Satellite Web Interface, go to "Hosts", click "Job templates", and then click on "Service Action - SSH Default". 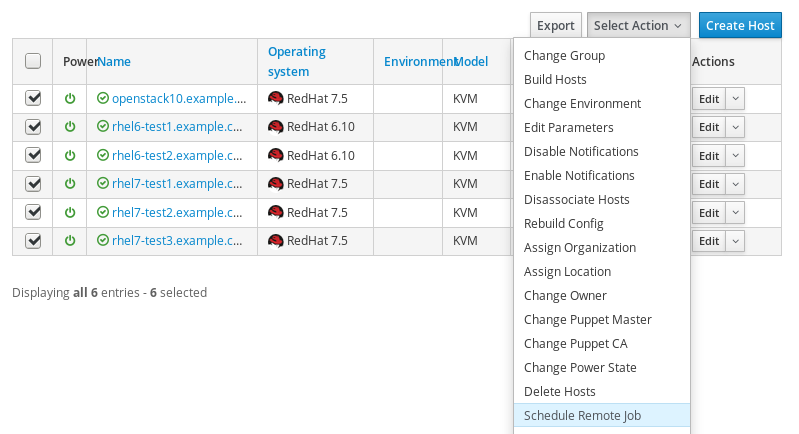 From this, we can see that if the host is running a version of RHEL greater than version 6, it should run the "systemctl" command, followed by variables that will be replaced with the specified action and service name. For all other hosts, it will run the "service" command, followed by variables that will be replaced with the specified service name and action. If we move over to the "Job" tab, we can see where the previously referenced <%= input("action") %> and <%= input("service") %> are specified. Here it is specified that the "action" can be restart, start, stop, or status, and the "service" can be any string that is specified. Just as is specified when we looked at this job template, it is prompting the user for the action to take (restart, start, stop, or status), and the name of the service. Once these are specified, the job template can be run and will take the specified action. It is possible to view a history of previously run remote execution tasks by accessing the "Monitor" menu in the Satellite web interface, and selecting "Jobs". It is also possible to initiate a remote execution task from this page by clicking on "Run Job" button. From the command line, a history of previously run remote execution tasks can be viewed by running "hammer job-invocation list". Satellite remote execution is a powerful feature that can help administrators manage their ever-growing environments. Remote execution is very flexible, and can be used from both the Satellite web Interface, and the hammer command line. To see a video demonstration of most of the topics covered in this post, see "Satellite Remote Execution" on the Red Hat Videos channel on YouTube. If you’d like to see more about Red Hat Satellite, you can watch (after registration) the recording from our webinar, "Ensure Immediate Value in your Red Hat Satellite Upgrade."